VATICAN CITY (CNS) — Just as the crowds and government officials tried to dodge responsibility for Jesus’ fate after he was arrested, so today too many individuals and countries want someone else to care for refugees fleeing violence and migrants seeking a better life, Pope Francis said. 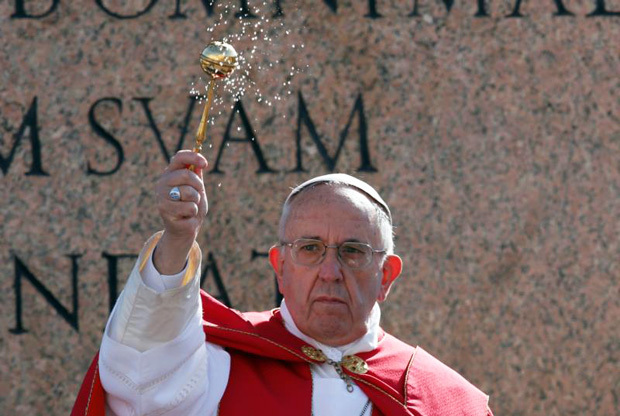 Preaching about the story of Jesus’ passion and death on Palm Sunday, March 20, the pope said that in addition to betrayal and injustice, Jesus experienced indifference as the crowds who had hailed his entry into Jerusalem, Herod, Pilate and even his own disciples washed their hands of him. “This makes me think of so many people, so many (marginalized), so many migrants and refugees for whom many do not want to assume responsibility for their fate,” the pope said in his homily. Greece and other European countries have been overwhelmed by refugees, particularly from Syria, Iraq and Afghanistan. An agreement between Turkey and the European Union went into effect on Palm Sunday to prevent refugees from attempting dangerous sea crossings from Turkey and to stem the continuing flow of refugees into Europe. Under the agreement, most refugees arriving in Greece will be returned to Turkey. For each refugee returned, one who has not left Turkey should be resettled in the European Union. 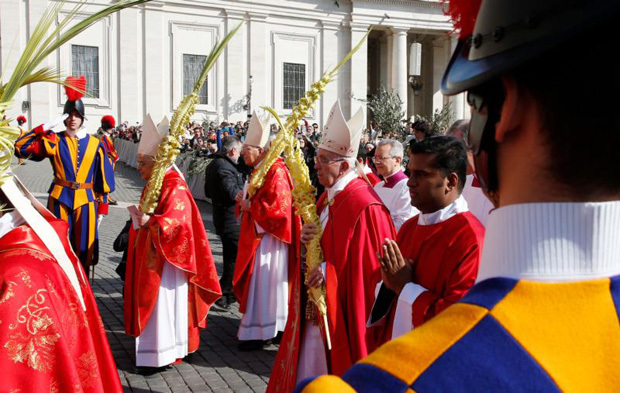 Carrying a woven palm branch, known as a “palmurello,” Pope Francis led the Palm Sunday Mass with more than 60,000 people gathered on a warm spring morning in St. Peter’s Square. Young people from Poland and around the world assisted at the Mass, carrying long palm branches in the procession and proclaiming the Scripture readings. With Krakow, Poland, set to host the international gathering of World Youth Day with Pope Francis in July, the day’s second reading was in Polish. 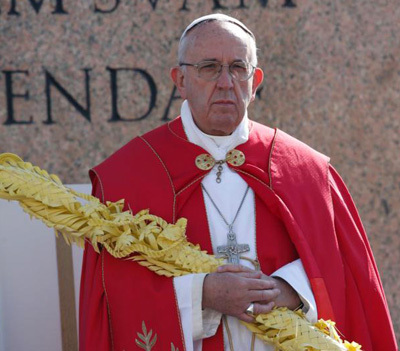 On the cross, at the height of his humiliation, Jesus reveals God’s identity as the God of mercy, Pope Francis said, adding that the cross is God’s “cathedra,” the place from which he teaches people all they need to know about him. “He forgives those who are crucifying him, he opens the gates of paradise to the repentant thief and he touches the heart of the centurion,” he said. Jesus’ life and death, the pope said, was a story of how, out of love, he “emptied and humbled” himself to save humanity. Instead, Jesus “takes upon himself all our pain that he may redeem it, bringing light to darkness, life to death, love to hatred,” the pope said.